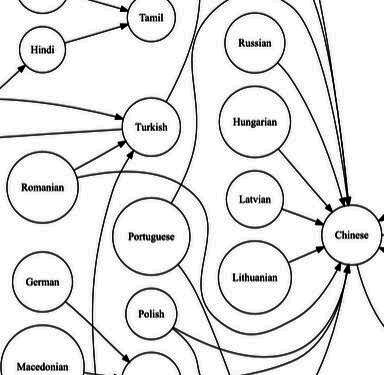 I found (well, I was directed to) this intriguing graph showing the equivalents of “It’s all Greek to me” in thirty languages. It is a thing of interesting revelations – such as Spanish (Spanish?) being the epitome of fogginess to Germans and Macedonians, and Javanese entirely baffling the French… I cannot say I ever heard a Frenchman or Frenchwoman refer to Javanese in this way – but then I am Italian, and I doubt I ever heard anyone use Aramaic as a synonym for unintelligible, either… Turkish, yes. Arabic, yes. Aramaic, never – and this in spite of having frequented a lot of theologians, a bunch of people more exposed to Aramaic than most. So perhaps the map is to be taken with the tiniest grain of salt – but is still very interesting as a map of stereotypical incomprehensibility.